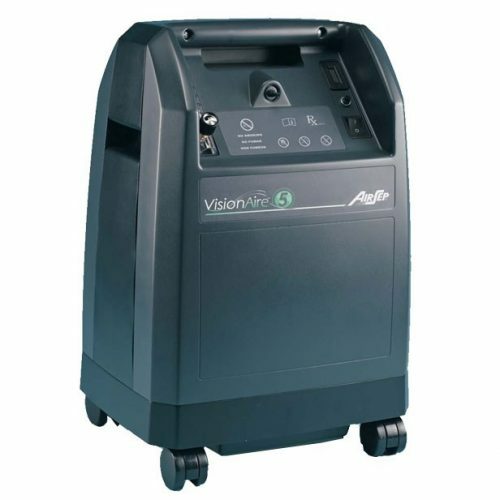 When it comes to home/stationary oxygen concentrators what comes to mind? Do you imagine big and bulky machines that are near impossible to lift, let alone transport? If so then you aren’t far off, as home concentrators weigh between 30 to 50 pounds, requiring you to ask for assistance just to go to a different part of your house. 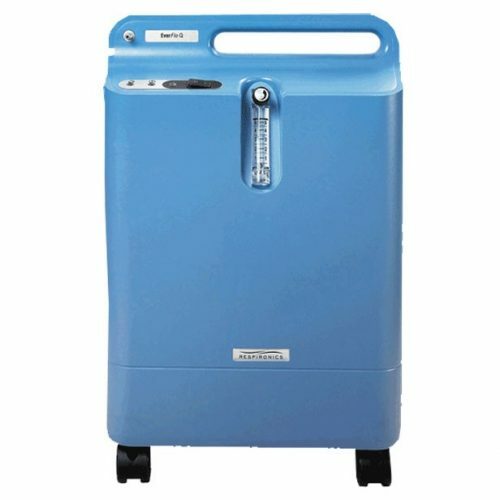 Separate yourself from the average home oxygen user and set yourself apart with the 18 pound Inogen At Home stationary oxygen concentrator, the world’s lightest at home stationary concentrator. Its advanced benefits will be apparent from the moment you open the box! If you require 1 to 5 liters per minute of continuous flow oxygen then the Inogen At Home is for you! 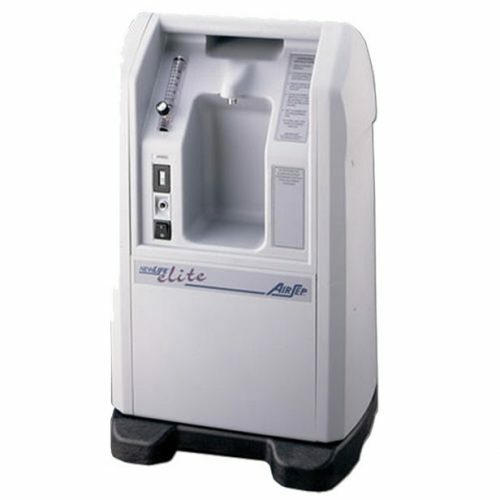 Standard stationary oxygen concentrators offer continuous settings of up to 10 LPM, but if you only require up to 5 LPM then those flow settings are useless and only tack on additional and unnecessary weight to the unit. Instead of being restricted and weighed down in your own home, free yourself with the Inogen At Home oxygen concentrator. Do you often struggle with reading the small text on many of the electronic devices you use every day? Squinting and straining your eyes just to perform a simple operation is let’s just say frustrating. With the Inogen At Home you won’t have to put yourself through the agony of trying to decipher hard to read text. Instead the control panel features an oversized power button, while also offering large flow adjusting buttons (+/-). There is also a presence of a general alarm and caution indicator so you can assure the unit is working properly at all times. Low priority alarms: A double beep and a solid yellow light. This can mean the column needs to be changed soon, low oxygen <82% for 10 minutes, sensor fail or low flow (flow indicator LED flashing). Medium priority alarms: Medium level alarms will have a triple beep with a yellow flashing light. Which either indicates there is an oxygen error <50% for 10 minutes, or there is a flow error. High priority alarms: Alarms with a high priority will be accompanied by a 5 beep pattern and a flashing red light. This will occur when the unit senses a fire hazard, if the unit is too hot, or the concentrator is too cold or if there is a system error. 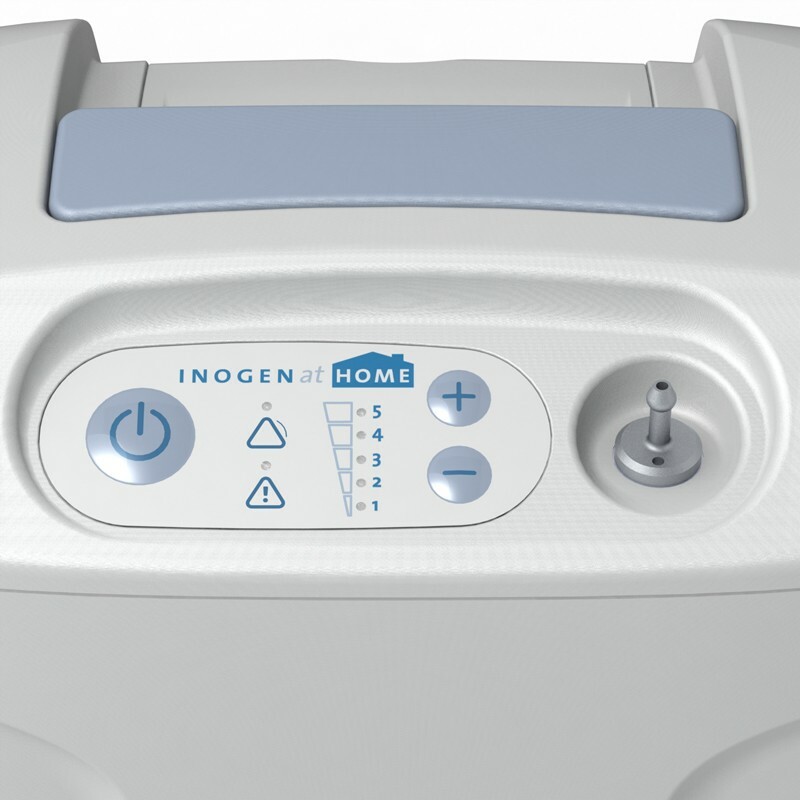 Just like your automobile or boat, the Inogen At Home concentrator requires some basic maintenance in order to ensure proper operation each and every time you go to use the machine. Don’t worry the maintenance precautions are simple and do not require an excess of energy to complete. Cannula replacement: After each use of a nasal cannula you should sanitize it by cleaning it with soap and warm water then allowing it to air dry, this will help to extend the life of the cannula. But remember cannulas are disposable, so as a part of basic maintenance you should be sure to swap old cannulas out for new ones at least every two weeks. Particle filter cleaning: The particle filter is in charge of filtering out dust, hair and other irritants out of the air before it is turned into supplemental oxygen and delivered to you. So you will want to make sure to clean the particle filter weekly with some warm water and soap, then allowing it to air dry completely. Weekly cleaning will ensure a proper ease of air flow and operation. Over time the filter will gradually decrease in functionality and need to be replaced. Surface cleaning: Maintain the pristine look of your Inogen At Home by doing a simple cleaning of the outer casing using a dampened cloth with mild soap and warm water. Keep an eye on the look of your machine, if you notice it getting a little dusty just follow the cleaning steps and boost the look of your machine. 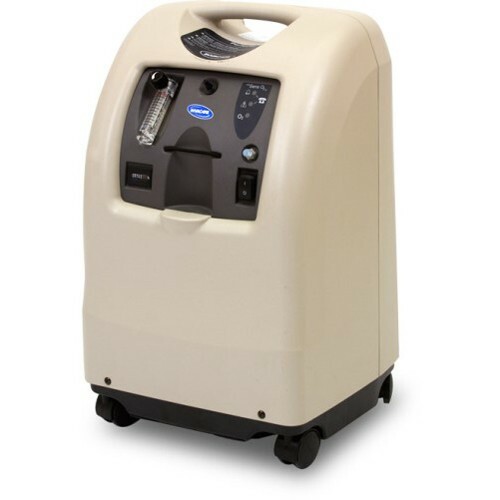 A huge problem respiratory patients have with using a home oxygen concentrator at all times is the worry that it will escalate their power bill to unaffordable levels. Which is why Inogen set out to engineer a machine that energy efficient but still able to satisfy patients with high flow demands. The Inogen At Home is the most energy efficient stationary concentrator available, compared to other units on a continuous setting of 2 the At Home by Inogen can save you almost $300 per year in electricity costs. That means you can spend your money on things that matter the most to you and not on unnecessary electricity costs. This can be powered by any of your homes conventional US or Canadian AC power outlets. 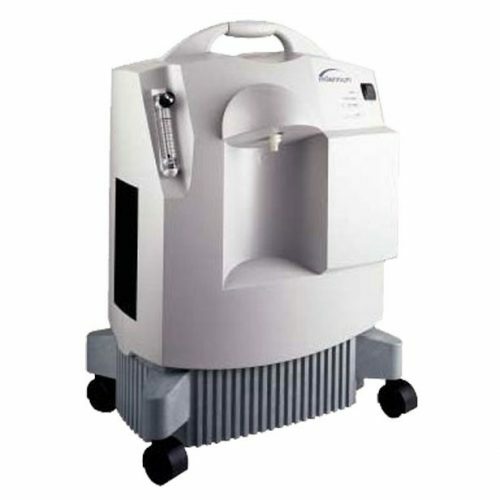 Often times oxygen patients worry about their home oxygen concentrator being disruptive to others during use. 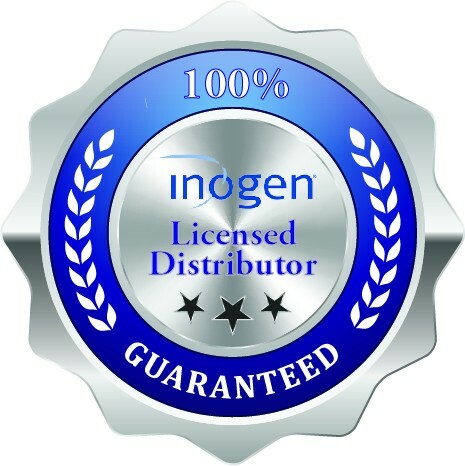 But once you become an Inogen At Home user you will see how quiet and non-disruptive it truly is. On a setting of 2 the sound level reaches a maximum of 40 decibels (dB). To put that into perspective, 40 decibels is more quite than a normal conversation level at 3-5 feet which produces a sound level of 60-70 dB. Finally you can saturate with peace of mind knowing you aren’t disrupting others around you. Due to the continuous flow of oxygen being administered patients may experience dryness in their nasal passageways causing unwanted nose bleeds. Which is why a humidifier bottle is so frequently used by patients and why Inogen made the At Home concentrator compatible with a humidifier bottle. That’s not all the unit is compatible with, it can also be used in congruence with both CPAP and BiPAP devices. Is the Inogen At Home CPAP/BiPAP Compatible? 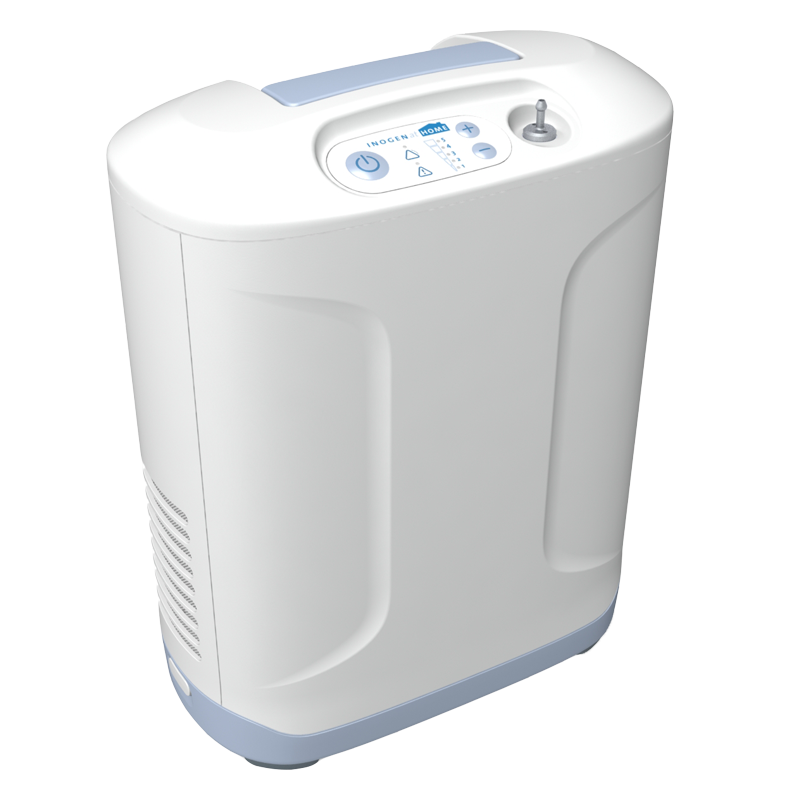 Yes, you can use the Inogen At Home 5 liter home oxygen concentrator in congruence with a CPAP or BiPAP machine. How Much does the Inogen At Home Weigh? Can I Easily Move the Inogen At Home?